Owning a dog is far more than just smothering them with kisses and giving them belly rubs. Spoiling them with things is another very important factor – at least your dog thinks so. Here’s a list of nine amazing products for your pup that are perfect for the fall season. Beds keep our pups nice and cozy during the cold fall weather. Check out these three beds perfect for the season! Tweed just screams fall! This handsome, durable dog bed from Harry Barker is made from a jute-polyester blend that’s both eco-friendly and mildew resistant. The dog bed cover is preshrunk and machine washable. Plus, the bed insert is made in the USA! Fall weather can sometimes create a bit of a chill, but the Soggy Doggy Super Snoozer is sure to keep your pup warm! It’s velvety-soft chenille noodles massage as they snuggle and support. The bed is anti-bacterial and quick-drying, perfect for pup who like to play in the wet outdoors! Take a look at this beautiful colored dog bed! 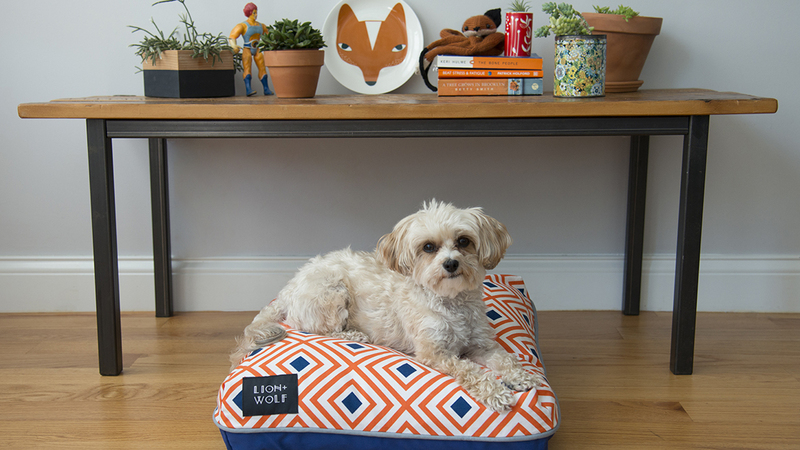 The Rhombus Dog Bed from Lion + Wolf features fall colored orange and white concentric diamonds, and is accented by a rich sapphire blue bottom. Your dog is sure to enjoy sweet dreams on this colorful geometric bed! Plus, the machine washable zip off cover will help pet parents keep the fur off its lovely design. Burr, it’s getting cold! Our pups think so too! No need to worry, these amazing coats will keep them warm! The Kurgo Loft Jacket is perfect for chilly fall days. This lightweight, reversible, and waterproof quilted shell made from rugged Microtomic Ripstop material will keep your dog warm through any climate. Available in various colors and sizes, the Loft Jacket is perfect for dogs big and small! The Joey coat from Billy Wolf is a khaki water-repellant canvas lined with cream faux sherpa. The utility pocket on the side of the coat can be used for their treats or your keys. Each coat is a limited edition, as they’re made from vintage, dead stock, and American-made fabrics in New York City. Not only will this water and wind-resistant shell keep your pup warm through winter months, this fashion statement is a must have! Available in several colors and sizes, the All Weather Jacket from Wildebeest is durable and adjustable to provide comfort and security for long walks or winter adventures. What’s fall without a few trendy pup accessories to go with your pooch’s overall style? After summer, a new collar is a must have. Not only are the Beast + Babe collars from Growler Goods an adorable fashion statement, their durability makes them an essential to get through fall and winter. Handcrafted in California, this collar makes a great one-of-a-kind piece that will last you through every adventure! Who else is headed to the mountains this fall? Make sure your dog is on trend wearing his/her “The Mountains Are Calling” dog tag! This handmade item is personalized and made to order to get your pup ready for the outdoors! Lastly, we all know that it can’t befall without some plaid! Dress your pooch to look the part with one of Wooflings adorable handmade plaid bandanas. With this perfect accessory, your pup will be the trendiest dog rolling around in piles and piles of fall leaves.